The Abu Dhabi Award for Excellence in Government Performance (ADAEP) was introduced in 2006 through resolution no. 45. It was initiated by H.H General Shiekh Mohamed bin Zayed al Nahyan, Crown Prince of Abu Dhabi, Deputy Supreme Commander in Chief of the UAE Armed Forces, and Chairman of the Executive Council. The Secretary General to the Executive Council, Mohammed Ahmed Al-Bowardi, chairs the Award committee and the criteria for award selection is based on the EFQM Model for Excellence. The Award was created specifically for the Abu Dhabi government organizations and SOEs as part of a vision to improve their performance and place Abu Dhabi in the top five governments of the world. The Award is not meant to segregate winners from losers, but to provide a comprehensive framework within which firms can evaluate themselves, and shine a light on where improvements can be made. It provides a guide for agencies on their journey to excellence, and is built upon years of experience and specific knowledge. This combination of experience and knowledge creates a type of organisational and operational wisdom that can aid in every aspect of business. 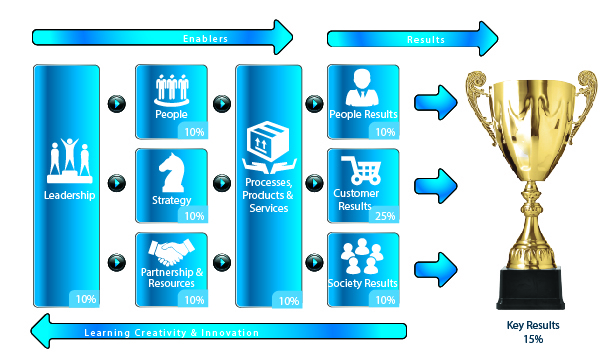 In essence, the awards operate as a tool for the implementation of the EFQM Excellence Model that is designed to motivate the Abu Dhabi Government to make improvements toward its goal of excellence.Through the adaptation of Total Quality & Excellence principles, government organisations can develop effective leadership that will rally their staff to deploy strategies through efficient management of processes and resources. Furthermore, the Awards serve to create a philosophy of excellence across government entities, promoting high quality ethics and transparency among managers and employees. The Abu Dhabi Award for Excellence in Government Performance (ADAEP) is built on a pyramid structure that places the award categories in a hierarchy of ascending levels. It is based on the concept that an organisation can only achieve excellence through their human resources and their ability to deliver top quality results in all projects. Fifty-one government entities in Abu Dhabi competed over the first category awards, which included the excellence incentives awards and sub-awards. Both of these prizes focus on key areas in the institutional system to support excellence.Also on offer is the Main Award, which is the ultimate prize at the ceremony. The highlight of the award ceremony and the most sought after prize, the Main Award, is given to the entity that achieves the highest levels of government performance. The awardee demonstrates the principals and concepts of the Abu Dhabi Award for Excellence in Government Performance, and is therefore considered the most distinguished entity in the Abu Dhabi government. The main award is assessed by external evaluators using a concept known as RADAR Theory (Results, Approaches, Deploy, Assess, and Refine). 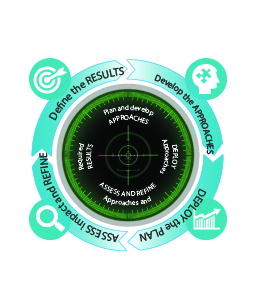 The RADAR theory offers a framework for the assessment of ‘Enablers and Results’. For the Enablers, assessors analyse the Approach, Deployment, Assessment, and Refinement of each entity’s efforts with regards to the development and improvement of excellence enablers. For Results, the assessors’ primary criteria are Relevance, Usability, and Performance Outcomes. A firm will be awarded points based on these attributes, turning the criteria for excellence and the RADAR theory into a scorecard for the assessment of the entire firm. This subcategory includes five awards reflecting certain priorities of the Abu Dhabi government. The first of these is the ‘Excellence in Knowledge Management’ award, which is awarded to the body that successfully provides tools for knowledge management, spreading, employment, investment and utilisation.Second up is the ‘Emiratisation Award’, which is awarded to whoever most effectively builds the competencies and capabilities of Emiratis, whilst also actively encourages the engagement of Emirati employees by developing their abilities to prepare future leaders. The third incentive award is the ‘Financial Excellence’ Award, which addresses the best practices in financial planning.Next up is the ‘E-excellence’ award, which is given to the entity with the best performing e-services platform. The 5th and latest addition to this category is the award for ‘Excellence in Risk Management and Business Sustainability’. This prize was launched to consolidate the risk management and business sustainability culture that is characterised by the ability to identify, evaluate, manage and address risks. Sub-awards focus on key areas in the institutional system to support excellence. The ‘Excellence in Leadership’ award reflects the importance of leadership and its role in inspiring and building a culture of excellence.The ‘Excellence in Services Provision’ award, which was launched to ensure that customer satisfaction is at the centre of the government work, it is awarded to the company that exceed expectations with the optimal use of resources.The ‘Excellence in Developing Human Resources’ award, places emphasis on the human resource sector and concerns the care, development and appreciation of all employees. This year, government entities were awarded for their efforts in making significant strides towards bettering their work. The ‘Excellence in improving performance’ award was given to those entities that demonstrated the greatest improvement in performance from the previous cycle. The second category of excellence awards is aimed at projects and teams and features five awards related to the application of leading practices in project management and team excellence. The first award in this set is the ‘Transformational Strategic Projects’ award, which goes to the government team that has successfully implemented a strategic project with clear and sustained benefits. The ‘Outstanding projects/teams’ award is the second prize in this category and focuses on projects delivered through the successful collaboration of more than one governmental entity with a focus on promoting teamwork.Thirdly, we have the ‘Excellent technical project/team’ award that is presented to the project team who successfully deliver a technical government project. The ‘Excellent customer service project/team award’ is another prize that emphasises the importance of delivering exceptional customer service to citizens and residents by recognising innovative and customer-centric projects. The final award in this category is the ‘Excellent internal improvement project/team’, which aims to recognise the most effective government excellence projects and teams that actively empower a high level excellence in their organizations. The third category of excellence awards is all about the people. This category is aimed at recognising the individuals who have demonstrated their exceptional commitment to serving the Abu Dhabi government in various capacities. Among these awards is the prestigious, long-service ‘Dedicated Employee’ medal awarded to employees who have worked for more than 20 years in the government of Abu Dhabi.The ‘Executive Director’ medal is also on offer, which celebrates excellence in executive government leadership. Additionally, the medal of ‘Excellent employee in the administrative supervision field’ is awarded to employees from different administrative levels that perform supervision roles, and the medal of ‘Excellent Employee in the Administrative Support Field’ is given to employees who perform important administrative work. 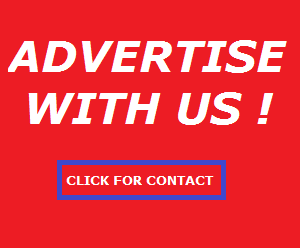 There is also recognition for employees who have dedicated their time to specialise in the respective fields. The two awards are: the ‘Distinguished Employee’ medal that is reserved for specialised professionals, and the ‘Distinguished Employee medal in the Technical Field’, an award allocated to technical professionals. Given the importance of customer service in achievement excellence in government performance, two medals are dedicated to recognising efforts in serving customers, the medal of ‘Excellent Employee in Supervisory Customer Service’ and the ‘Excellent Employee Medal in non-supervisory Customer Service’. The last two awards in this category are the ‘Excellent Employee medal in the site field’, an award dedicated to all the employees of Abu Dhabi government whose job specifications require fieldwork, and the ‘Excellent New Employee’ Medal, awarded to new government employees who have quickly become rising stars and champions of organisational excellence. The 4th cycle of the award was launched at the end of 2014 with the participation of 51 Government entities in Abu Dhabi competing for the esteemed prizes. H.H. Sheikh Mohamed bin Zayed Al Nahyan, Crown Prince of Abu Dhabi and Deputy Supreme Commander of the Armed Forces and Chairman of the Executive Council of the Emirate of Abu Dhabi, H.H. Sheikh Hazza bin Zayed Al Nahyan, National Security Advisor and Vice Chairman of Abu Dhabi Executive Council, honoured the winners of the fourth edition of Abu Dhabi Award for Excellence in Government Performance in a ceremony held on the 17th of November at Abu Dhabi National Exhibition Centre (ADNEC). 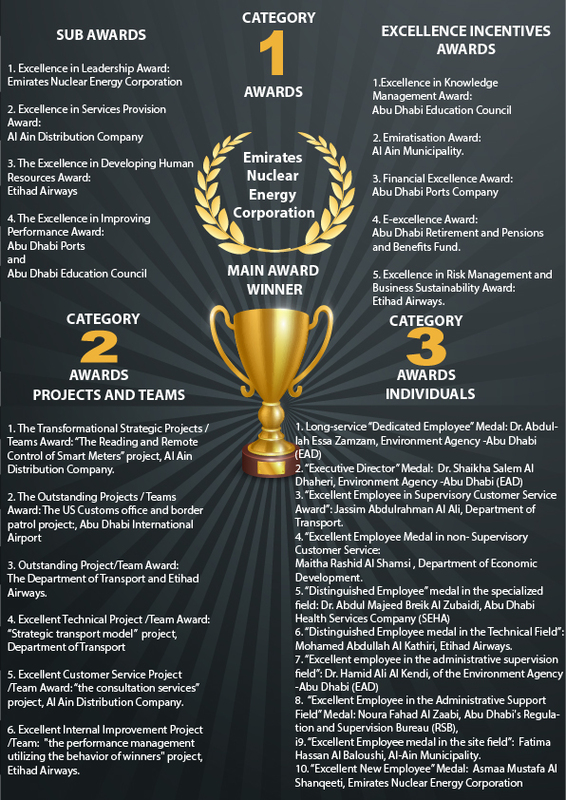 The prestigious Main Award was handed out to Emirates Nuclear Energy Corporation who also picked up other awards in different categories. Another big winner on the night was the team at Etihad Airways that managed to pick up four awards, including being honoured in all three of the major categories. Congratulations to all the winners!